The ultimate guide to buying a diamond engagement ring! Buying an engagement ring is one of the most important purchases you will make in your life. Not only because you want to make sure it is absolutely perfect for your bride-to-be, but also because it has a significant price tag. You start to research how you can buy the perfect engagement ring, without breaking the bank. Unfortunately most of the advice you see is pushing you towards the most expensive diamonds on the market: diamonds that are (almost) flawless and are almost perfectly white. You wonder if it is really necessary to buy a perfect diamond, but you do not want to present a flawed diamond to your future wife. So in the end you cave and spend thousands of dollars on that near perfect diamond. We are here to tell you that it is not necessary to buy a ‘perfect’ diamond. What matters is that the diamond looks fantastic to the naked eye. It doesn’t have to look perfect under a microscope. You can easily save 30 to 50% by buying a diamond that has imperceptible imperfections. What’s the catch you ask? Well you will need to inspect the diamonds and select the best one. Don’t leave yet, you don’t have to become a gemologist or head to dozens of jewelry stores. There are now online stores that offer high quality 360° photography of every diamond they sell. Some even offer a 20x magnification. This will make choosing your perfect diamond for a far lower price possible. How? By only paying for features that you can see with the naked eye. Nobody will notice the difference unless they are in the habit of bringing a microscope everywhere they go. You can then use the money you saved on something else, or you can opt to buy a (much) larger stone. The largest jewelry store that offers this must-have feature is James Allen. If the above sounds like too much work you can contact us and we will do it for free. Read why we do this for free. If you want to be involved in the purchase from beginning to end you should read the rest of the guide below. This clear and concise guide will give you all the information you need to make an informed purchase. Every section will have a short recommendation at the top. You can either read the rest of the section for the nitty-gritty or get straight to the buying part. Either way will allow you to get the best value for your money. Feel free to contact us with any questions you may have. We’re happy to help! Almost everyone looking for a diamond engagement ring has heard of the ‘4Cs’. Not only will we explain what they are, but we will also show you how you can use them to save hundreds or even thousands of dollars without sacrificing any beauty. Color: Most engagement rings still showcase white diamonds and the whiter the better. Clarity: This refers to how clear the diamond is of (small) imperfections and inclusions. Cut: It is sometimes used to refer to the shape of the diamond, but in the 4Cs it stands for how well the proportions of the diamond are. A higher cut grade results in greater brilliance. Carat: This means the weight of the diamond. The price of a diamond increases exponentially with carat. Our recommendation: For round brilliant diamonds set in white gold or platinum rings buy an I or J color. 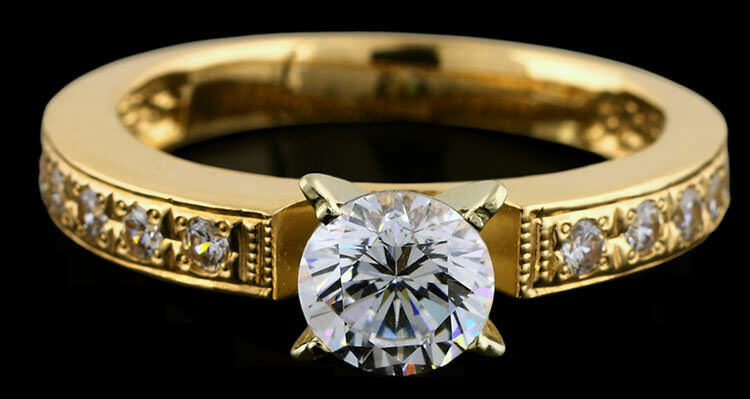 For yellow gold rings K-M. Side diamonds should be one color grade lower than the center stone. The best color for princess cut diamonds is one color grade higher than for round brilliants. All information in this section is about white diamonds. We are working on a guide to fancy diamonds, but for now you can directly contact us for advice. Many vendors will say that color is the second-most important feature of a diamond, after cut. In our experience this is simply not true. 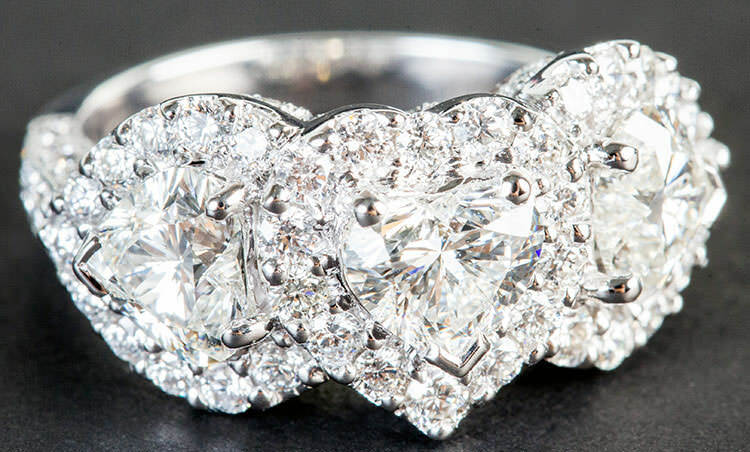 At least not for the most popular shape, the round diamond. Unless you are friends with a diamond expert nobody will notice the difference between a diamond with a D color and one with an I or J color. However you will pay up to twice as much for a D color diamond! The difference between for example a J and G color diamond is even lower. The following two diamonds will look virtually identical once in their setting: a J color diamond and a G color diamond. The G color diamond is $1,640 or 38% more expensive! Round brilliant solitaire diamond engagement ring – click here for examples of I-J color diamonds. The fact is that the color of a diamond is relative. You will only see the difference in color if you place two diamonds next to each other. You might think “well I see people comparing their rings all the time!” and you would be right. However, the important word here is rings. They compare their diamonds when they are already in their setting. The setting influences the color (or lack of color if you prefer) of your diamond. The difference in diamond color is only really noticeable when you place the loose diamonds next to each other. This is also how diamonds are graded, by comparing them to color samples. In practice this will of course never happen. The I or J color only applies if you are looking to buy a round brilliant diamond set in a white gold or platinum engagement ring. If you are eyeing a yellow gold setting you can easily drop a few more grades to a K, L or M color. The reason is that the yellow of the gold cancels out the yellow tones in the diamond, causing the diamond to look more colorless. In fact a well-known scam is to place a tiny piece of yellow foil behind the diamond to make it look like a higher color grade. If you are looking for a princess cut diamond you should go up one color grade. So H or I for white gold and platinum or J-L for yellow gold. Solitaire diamond engagement ring with semi-channel set diamonds in yellow gold. The yellow gold cancels out some of the yellow color in a diamond. The only time you should pay special attention to the color of diamonds is when you are looking to buy an engagement ring with side diamonds. Always make sure that the center diamond has either the same color grade as your side diamonds, or ideally the center stone is one color grade higher. This will make the main diamond look even better. Fluorescence is not always bad, in fact it can even improve the color of your diamond! Many people are under the impression that diamond fluorescence is always a bad thing. It is not. In higher color grades (G or higher) it can lead to a hazy or milky look, but usually it does not. However, in lower color grades (I or lower) it usually improves the color. Because so many people avoid any diamond with fluorescence the prices of diamonds with this effect are lower. So if you are looking to maximize your budget you should look for an I or J color diamond with faint to medium fluorescence. There are diamonds with higher fluorescence, but in some cases they will look hazy or milky. If you have plenty of time and don’t mind returning a diamond or two you can save a bit more by opting for strong or even very strong fluorescence. But in general you will be better off with faint to medium fluorescence. You can of course ask the store to let their gemologist inspect the stone and give their opinion. However, you should know that many online retailers do not inspect the diamonds themselves, but instead let the wholesalers they buy from inspect the stone. This is of course a clear conflict of interest. You can read more about this in our ‘Where to Buy Your Engagement Ring‘ section. Please contact us if you want free professional help in finding the right diamond for you. Our recommendation: Look for the lowest clarity grade you can buy that is still ‘eye-clean’. This means that you should only buy diamonds from a vendor that offers very high quality photos. You can go as low as SI1 or even SI2 and still have an ‘eye-clean’ diamond if you look around. The clarity grade of a diamond is based on how ‘clean’ the diamond is. The less inclusions or blemishes on the diamond the ‘cleaner’ it is and the higher its clarity grade. The GIA clarity scale is the most used clarity grade system in the industry. The clarity grade of a diamond is determined by a skilled grader with the naked eye and 10x magnification. Flawless (FL): With 10x magnification no imperfections are visible. Internally Flawless (IF): With 10x magnification no inclusions are visible, only blemishes. Very, Very Slightly Included (VVS1 and VVS2): With 10x magnification inclusions are difficult to find. Very Slightly Included (VS1 and VS2): With 10x magnification minor inclusions can be found. Slightly Included (SI1 and SI2): With 10x magnification inclusions are easy to find. Some flaws may be seen by the naked eye. Included (I1-I3): With 10x magnification inclusions are obvious and can affect the brilliance or even transparency of a diamond. Now why is the above scale important? Well, as you can see only at the ‘Slightly Included’ clarity scale will you start seeing inclusions that may be visible to the naked eye. The imperative word here is ‘may’. Many SI1 and some SI2 diamonds will be ‘eye clean’ and present an opportunity to buy a diamond that, to the naked eye, is identical to a higher clarity grade diamond with a far higher price. Because let’s be honest, why would you pay a higher price for something you will not even see? An I2 clarity diamond under 10x magnification (click to enlarge). This diamond will be almost eye-clean, but you can easily find far better SI1-SI2 diamonds. Now you may think that the above seems too good to be true, and in a sense it is, because you need to be able to identify SI1 and SI2 diamonds without eye visible inclusions. 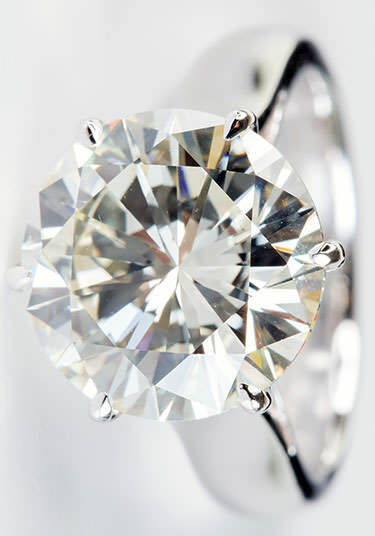 This is because the clarity grade usually only looks at the size of the inclusions compared to the size of the diamond. This means that a diamond with a dead center black inclusion can have the same clarity grade as a diamond with a barely noticeable inclusion towards the side of the diamond. We know this is strange, but it is the reality in the diamond industry. To find these SI1 and SI2 diamonds you used to need to see the diamonds in person, unfortunately brick and mortar jewelry stores are far more expensive than online stores so you could not save any money. Fortunately a solution has been found in high quality photography. An example of this is the 360 degrees Diamond Display Technology used by James Allen. Here they provide actual photographs around the entire stone with a 20x magnification for every diamond they sell! This will make finding the inclusions in the diamond possible (and usually very easy). Now you can select a diamond that has a low clarity grade, but has no inclusions that are visible to the naked eye. This can easily save you 30-50% compared to a higher clarity grade diamond. A diamond should not be seen as an investment by any consumer. The first is that they are under the impression that diamonds are a great investment. You will often see claims that diamonds appreciate by 6% to 10% every year. However, only ‘investment grade’ diamonds appreciate by that much. These diamonds are of course the rarest (and most expensive) diamonds there are, with near perfect color, clarity and cut. Even if these figures are true, which we highly doubt or everyone would be buying diamonds and they are not, it conveniently leaves out the fact that you, the consumer, are not buying the diamond at cost (or even wholesale value). You can expect to pay a markup of at least 10-30% when buying online to pay for distribution and retailing of your diamond. Brick and mortar stores need an even higher markup to make a profit due to the cost of keeping a store running. Now you may think that it will only take a few years to make up for that markup and you would be right. However, you will not be able to sell your diamond at wholesale value. The average consumer simply does not have access to the wholesale market. So you are left with trying to sell your stone to a (local) jeweler. Here you should consider yourself lucky if you can sell it back for 20% under wholesale value. Basically this means that if you are (very) lucky you will be able to sell your diamond back for what you paid for it 5 to 10 years ago. Realistically speaking you will likely never be able to sell your diamond at a profit, especially when you take inflation into account. Why do we tell you this? Because we want you to find the best looking diamond your money can buy. Not waste your money on features you cannot see, thinking it will be a great investment. The second reason is that they want to make sure their diamond is ‘eye clean’. If you cannot examine the diamond in person or there are no high quality photographs you will be forced to buy a very high clarity grade to avoid visible inclusions. The solution to this problem is simple: only buy from a merchant that has high quality photographs of every diamond they sell. Only then can you select a lower clarity grade and still have an ‘eye clean’ diamond. Buying offline is an option if you insist, but it will easily cost you an extra 20% (and often far more) for the same diamond. An excellent cut solitaire diamond set in a platinum engagement ring. Our recommendation: Look for GIA certified diamonds with a ‘very good’ or even ‘excellent’ cut or for AGS certified diamonds with an ‘excellent’ or ‘ideal’ cut. Cut is often synonymous with shape, but in the 4 Cs it stands for the proportions of the diamond or how well it was cut. Cut is arguably the most important factor for the brilliance of a diamond. Simply put, a poorly cut diamond will show far less sparkle than a well cut one. There are many factors that influence the cut quality, for example: the depth percentage, the length/width ratio, crown angle and many more. Now how do you find a diamond with a good cut, without having to become a diamond expert? Simple; look for a GIA certified diamond with a cut that is at least ‘very good’. Diamonds with an ‘excellent’ cut are slightly more expensive, but they are also worth buying for their noticeable increase in brilliance. If you are looking at an AGS certified diamond you should look for a cut of ‘excellent’, though upgrading to an ‘ideal’ cut is also worthwhile. Please note that a GIA certified diamond with an ‘excellent’ cut is not the same as an AGS certified diamond with the same grade. AGS consistently grades diamond cuts one grade higher than GIA (e.g. a GIA ‘very good’ cut would be graded as ‘excellent’ by AGS). Don’t be fooled by cheap 1+ carat diamonds, cut, clarity and color are far more important for the beauty of diamonds. A diamond carat weighs exactly 200 milligrams (0.2 gram). The cost of a diamond is for a large part determined by its carat weight. This is because high quality diamonds become more rare at higher carats. It sounds logical that a higher carat diamond will be larger and show more brilliance than a lower carat diamond. Now while this is generally true, it does not always have to be. For example if you have a diamond of 1.1 carat that has been cut too deep it can actually look smaller than a diamond of 1 carat that has been well-cut. Not only that, but the 1 carat diamond will also show more brilliance, because a poorly cut diamond will ‘leak’ light through its sides, instead of reflecting it back to the viewer. Instead of looking at weight you should be looking at the quality of the cut and the diameter of a diamond. After all this is what determines its brilliance and how large it will look. First you should determine what color (I or J), cut (very good or excellent) and clarity (SI1 or SI2) you want to buy. After that you can look for the highest carat diamond that meets your criteria and, most importantly, fits in your budget. Our recommendation: Buy a diamond at the top of the weight categories listed below. You can easily save 10-20% by buying a 0.98-0.99 carat diamond instead of a 1.00 carat diamond. Always focus on cut instead of color and clarity. Not only does cut have more effect on the beauty of your diamond, it also has less impact on the price. Earlier we mentioned that diamond prices increase exponentially with carat weight. You might think that this is a continuous increase and that would make sense. However, the diamond industry does not always make sense, because much of it is based on emotion and traditions. You might think that finding the price per carat of your diamond and multiplying it with the carat weight would give you the price of that diamond. Unfortunately you would be wrong, the diamond price listed on the Rap List does not take things like fluorescence, cut grade, polish and more into account. Diamond prices are based on the Rap List price, but are almost always sold at a discount of at least 15% and up to 40%. How do you know what the discount was for the diamond you are looking at? You don’t, unless you have years upon years of diamond industry experience. Even a world-class expert would be hard-pressed to determine the correct discount for every stone. A loose princess cut diamond – the price per carat for every diamond shape is different, but the same principles apply. How can I use the Rap List to get more value for my money? From the above table you can see that the price per carat of a 0.90 to 0.99 carat diamond is the same. 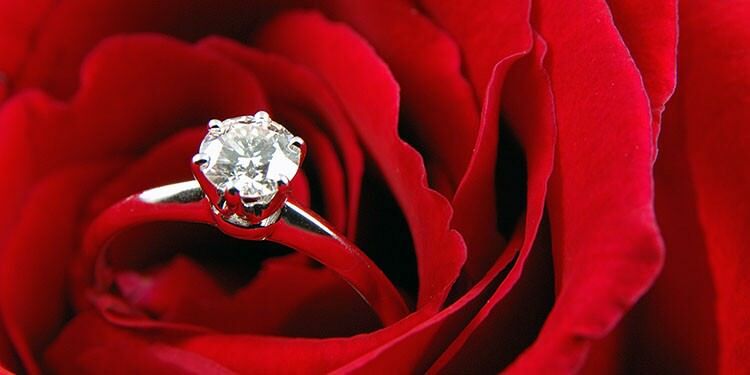 This means that for example the price of the 0.99 carat diamond will be 1% higher than the 0.98 carat diamond. Now what is important to note is that the price per carat jumps at every category level. The largest jump for some reason is from .99 to 1.00 carat. For the diamonds we recommend (I-J color, very good or excellent cut and SI1 or SI2 clarity) the price per carat jumps around 20%. So for 1% more weight you will pay 20% more money. For diamonds that are almost flawless this price jump becomes even greater, up to 60% in some cases. Why is this the case? Who knows, perhaps people simply like a round number or a 1 carat diamond is the smallest diamond they will consider. In any case, this price jump is the reason that there are literally hundreds of thousands of poor to average cut diamonds on the market. ‘Underweight’ diamonds are hard to find, but offer great savings. A diamond cutter will do anything possible to make sure that his diamond becomes a 1.00 carat diamond, rather than just below that. Even if this means that the diamond will be poorly cut and lose a lot of its brilliance. The price jump will more than make up for the lower price of a poorly cut diamond. Another strange thing is that color and clarity have far more influence on the Rap List price than cut. This despite cut being the most important feature of a quality diamond. What this means is that you can drop in color and clarity grade, increase the cut grade at the same time and end up with a better looking diamond at a lower price. 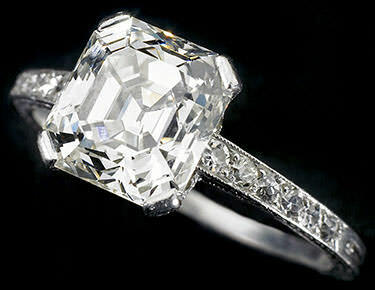 For example the listed price of a 1 carat G color VS1 diamond with a poor cut would be $8,200. Due to the poor cut a discount of 40% is given and the final price of the diamond is $8,200*0.60 = $4920. At the same time the listed price of a 1 carat I color SI2 diamond with an excellent cut would be $4,600. Due to its excellent cut the discount is only 15%. The final price of this diamond will be $4,600*0.85 = $3,910. Trust us when we say that the last diamond will look far better than the first diamond. Not only will it look better, it is also cheaper. Ideally you would want to buy a diamond at the top of a weight category. For example a 0.69, 0.89 or 0.99 carat diamond. However, because cutters do whatever they can to get to a higher weight category these diamonds are quite rare. James Allen only lists 21 round brilliant diamonds with a carat weight of 0.98 or 0.99. At the same time they have 2,033 diamonds with a carat weight of 1.00 or 1.01. This shows that finding an ‘underweight’ diamond is a daunting, but not impossible task. If you have the time to wait and look for the perfect opportunity, you can save hundreds of dollars. If you spot a great deal, you will have to make a quick decision because these type of diamonds will usually sell within a week. A classic white gold engagement ring – note the six prongs for extra security. Our recommendation: A polish and symmetry of ‘good’ is all you need. Anything higher is fine, but it will cost you more without benefit. Polish and symmetry are two other features of a diamond whose importance are overstated to impress a new buyer. Polish simply means how smooth the surface of a diamond is. Basically the longer a diamond is polished, often with a finer diamond grain, the higher its polish. You may think that the higher the polish the better, and to some extent that is true. However, it is virtually impossible to find the difference between a diamond with ‘good’ or ‘excellent’ polish, even when magnified 10 times. So keep some money in your pocket and buy a diamond with ‘good’ polish. Note: If you go lower than that you might start seeing a difference, but very few vendors even carry those. Blue Nile for example does not sell loose diamonds with a polish graded lower than good by the GIA. The symmetry of a diamond is important. A diamond with misaligned facets or a wavy girdle will certainly be less beautiful. With that out of the way, we will tell you that symmetry in this regard is very much alike polish. Once you have a symmetry that is ‘good’ any further upgrade will not be noticeable unless you regularly inspect it under a microscope. Basically you will be spending money on something nobody will ever see. Our recommendation: Only buy a diamond that is certified by GIA or AGS. Every other grading lab is not consistent enough and some border on fraud. Whatever you do, do not buy a diamond certified by EGL Europe, Hongkong or Israel. Let us start off by saying that a certificate is by no means a guarantee that a diamond is exactly as described. Mistakes can, and do, happen. That is another reason to only shop at a store with high quality photographs of the actual diamond. This way you can compare the diamond to the certificate. The most important thing in a certification is consistency. If the laboratory that does the grading is not consistent you might get lucky and receive a diamond that is better than the certificate describes. However, you are just as likely (and probably more likely) to receive a diamond that is worse than the certificate describes. This is the main reason for buying a diamond that has a certificate from a grading lab with a great reputation. Consistency is the most important feature of a grading lab. The GIA and the AGS are the most consistent labs in the world. It is important to keep in mind that grading is not scientific. There are no agreed upon definitions of color and clarity grades. What this means is that one lab can call a diamond a J color, while another calls it an H color. Neither of these are wrong, all that matters is that they call that diamond by the same color every time. Now here is where it gets tricky, many people think they can directly compare a certificate from one lab to one from another lab. This is not true and it will lead you to overpay for a diamond with a certificate from a ‘loose’ grading lab. Below is a list of grading labs you will most often encounter when looking to buy a diamond. The best known and respected certificates in the business are from the GIA. They are the most consistent lab in the world and only one other lab comes near: the AGS. The AGS is another respected lab, but it is a bit ‘looser’ than the GIA. On average we estimate this to be 1 full grade of either color or clarity. Sometimes this is priced into the diamond, sometimes it is not. It is important to keep this in mind when comparing a GIA certified diamond to an AGS certified diamond. Regardless, an AGS certificate is perfectly acceptable. The EGL is a for-profit organization that runs labs in multiple locations. Their grading is extremely ‘loose’ compared to the GIA and AGS. They run different labs, but all of these give an average upgrade of at least 1 grade of either color or clarity. Some of their labs, Europe, Hongkong and Israel, grade far looser than that. We won’t bother you with all the details of why this is the case, but think about this: As a for-profit organization who do you think they will treat more favorably, the diamond company that pays for the certificate or you, the consumer? Basically you should stay away from any EGL certified diamond as you have no idea of the ‘upgrade’ your diamond received compared to a more consistent lab. You might think you are getting a great deal, but trust us, you are not. The diamond companies that use EGL certificates are excellent at maximizing their own profit and letting you think that you won. The IGI is the most popular certificate outside of the U.S. and for good reason: they are cheap and they have quick turnaround times. Both of these are very important to the companies that send diamonds to be graded. It is not important to you as all that matters is consistency. According to an investigation by RapNet they are very consistent and comparable to the GIA. This is debatable as quite a few diamond industry insiders know that on average they give a diamond an upgrade of around 2 grades (either color or clarity). Regardless you will not often encounter this certificate in the US. You cannot directly compare diamond certificates from different labs! In the end the conclusion is that GIA and AGS (though AGS is a bit looser) are the most consistent and trusted certificate in the industry. 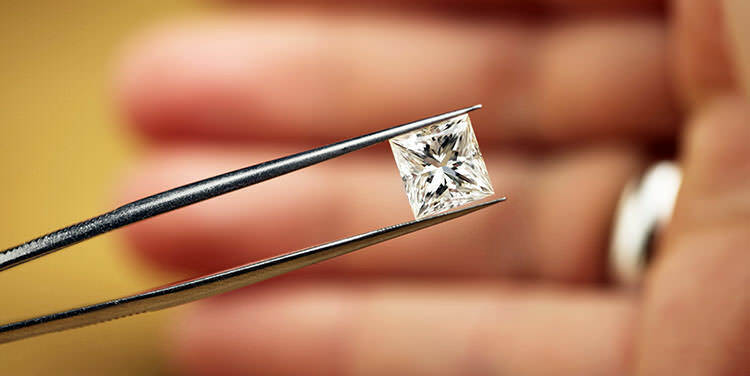 Buying a diamond certified by either of these labs ensures that it is not ‘over-graded’. We advise against buying a diamond graded by any other lab, no matter how great a deal you think you are getting. Whatever you do never buy a diamond with an EGL certificate, especially one that is not EGL USA. However, as we said earlier, mistakes do happen and comparing the actual diamond with the certification is the only way to ensure your diamond is not one of these mistakes. For this you need high quality photographs and only one major vendor offers these for their diamonds: James Allen. A diamond engagement ring with matching wedding band. Our recommendation: Shop at James Allen. Why? Because they have access to a diamond inventory that their gemologists can inspect in person. Blue Nile’s inventory process leaves room for embellishment by their wholesalers. The prices of both stores are roughly similar as far as they can be compared. The customer satisfaction of both stores are also similar, but the customers of James Allen were more satisfied with the product they received. Combine this with the availability of high definition diamond photography that allows a savvy customer to cherry-pick the best diamond and the conclusion is easy: James Allen is clearly the better store if you are looking for the perfect diamond engagement ring. High quality photography of every diamond is a must for any educated online purchase. The first choice you will have to make is whether you will buy from a brick and mortar jeweler or online. The main advantage of a brick and mortar jeweler was that while it was more expensive to buy a diamond there you could actually see it in person and make an educated purchase. The introduction of high definition photography of loose diamonds by some online jewelry stores has changed this. You can now make an educated purchase and actually see the diamond you will purchase. Another advantage is that you can pick and choose the diamond from the comfort of your home, without being pressured by a slick salesman that is only looking to increase his own commission. Of course buying online is also far cheaper, you can easily save 20% or more. Therefore our recommendation is simple: buy online. The second choice is harder, which of the hundreds if not thousands of online jewelry stores is the best? Comparing every single one of these is simply impossible so how do you know you have made the right choice? The answer is quite simple: shop at a store that offers high quality photographs of the actual diamonds they sell. Only then will it be possible to make an educated purchase and not overpay for features that are simply not visible. Because virtually no jewelry stores have this option yet this narrows down your choice dramatically. At the moment there is only one major store that offers this must-have feature: James Allen. So how favorably do they compare to the premiere online engagement ring store; Blue Nile? We will score them on three categories: selection, prices and customer satisfaction. Online retailers do not own their diamond inventory. So local suppliers are a must for an inspection by an in-house gemologist. Blue Nile has the clear lead in diamond selection with almost 240,000 diamonds listed in their inventory. James Allen ‘only’ has 66,000 diamonds in theirs. Blue Nile seems the clear winner here right? Well, maybe not, Blue Nile like almost all online jewelry stores, do not actually own all these diamonds. The amount of capital needed for that is simply too much. Instead they list diamonds from wholesalers on their site. Now what Blue Nile does is they only list diamonds if they are giving exclusive rights to these diamonds. This guarantees that nobody will see the diamond on another site. Making a price comparison impossible. 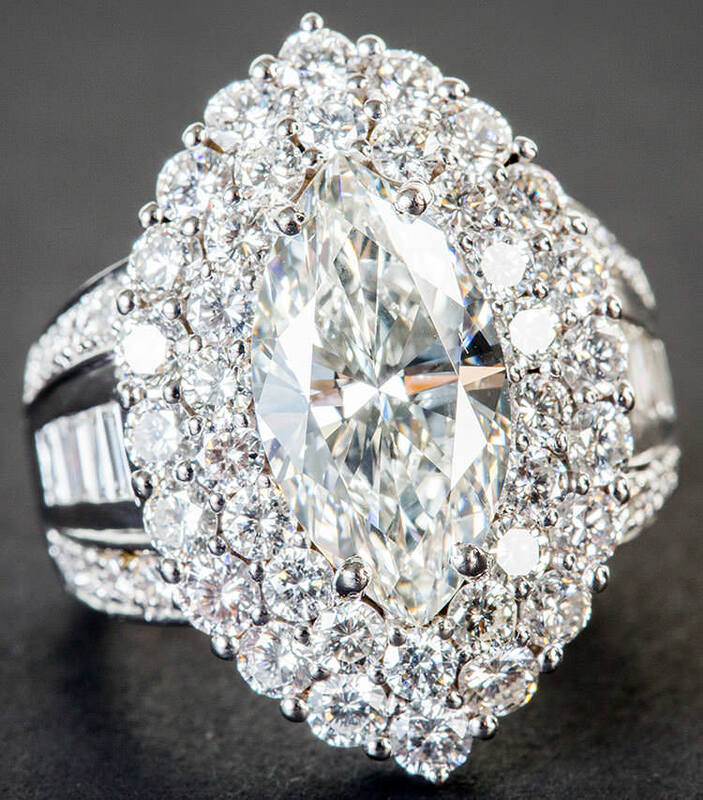 What is more important is that these wholesalers are located all over the world and Blue Nile does not necessarily see the diamond they have sold to you at any point. This opens up the very real possibility that the wholesaler can slightly bend the truth. Say you have found a great diamond, but because you cannot actually see photographs of it you want to make sure it is eye clean. So you call Blue Nile and ask for their gemologists opinion on the stone. Now what will most likely happen if that diamond is halfway across the world is that they call up the wholesaler to ask their opinion. Do you see the conflict of interest here? The wholesaler wants to sell their stone and will be sorely tempted to embellish the truth. Now we are not saying that this actually happens, because it is almost impossible to prove this. However, the fact is that the Blue Nile system makes it possible and that is troubling. Gift packaging that fits the occasion is important and both Blue Nile and James Allen impress here. James Allen also works with wholesalers and does not own their inventory. However, they only work with local vendors, hence the far smaller inventory. This means they can actually inspect the diamond themselves when you ask for their opinion. They do not have an incentive to sell you a sub-par diamond, because they can simply point to a similar diamond that is a better value. They make the same amount of money in both cases, but they will have a happier customer. The only time we might rate the selection of Blue Nile higher is when you are looking for a shape other than a round brilliant or a princess cut. The size of Blue Nile’s selection means they have diamonds in whatever shape and size you are looking for. No other merchant can say the same. Keep in mind that you might have to return one or more diamonds to Blue Nile because you are unable to inspect them before the purchase. This is especially true for these less popular shapes, as the measurements do not tell the whole story there. The alignment of the facets (not just simple symmetry!) is extremely important and you cannot evaluate this from the certificate. For round brilliant and princess cut diamonds we strongly recommend James Allen. 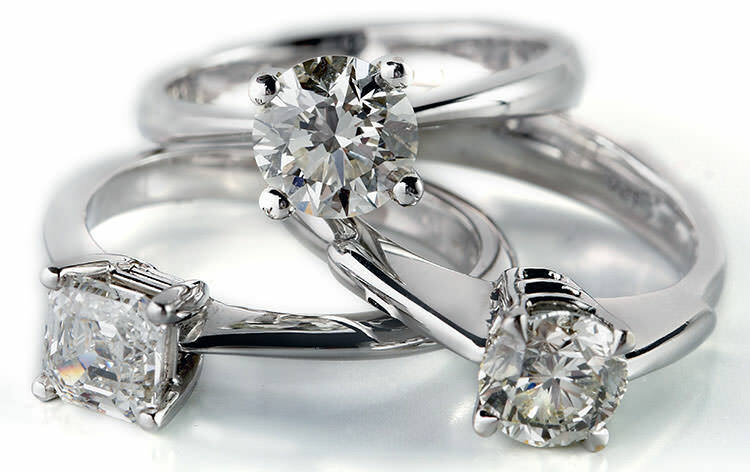 With their selection of over 21,000 round or princess cut diamonds you will certainly find your perfect diamond. For other diamond shapes their inventory is slightly more limited and you might need to wait for a while to find the right diamond. The prices at both stores are quite similar. Both are very large online jewelry stores with accompanying economies of scale. A direct price comparison is impossible as no diamond is listed on both sites. From our investigation it seems that their prices are within a few percent of each other. 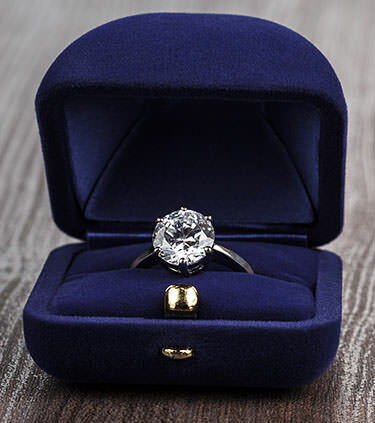 Because Blue Nile is listed on the stock exchange and the extra oversight and measures that entails make it likely that they need slightly higher prices to get the same margins. However, because we are unable to objectively compare the prices of both stores we will call this part undecided. Ultimately this is what matters most. That you, the customer, are happy with your shopping experience. This includes prices, the quality of the product, packaging, but also the customer service. Basing our verdict on a single purchase at both sites like some other review sites do is too subjective. You might be very happy with your order at one site and have a bad experience at the other. Either of those could simply be a fluke. So instead we turn to one of the largest independent review sites: BizRate. As you can see the ratings for both jewelry stores are extremely favorable. The thing that stands out to us are that the ratings for ‘Product Met Expectations’, ‘Customer Support’ and ‘Returns Process’ for JA are all higher. For Blue Nile the price is reviewed slightly more favorably. In the end both stores are excellent choices, but to us JA wins out because customers are more satisfied with the product they received. In the end that is most important. James Allen has a diamond inventory that their gemologists can inspect in person. While Blue Nile’s inventory process leaves room for embellishment by their wholesalers. The prices of both stores are roughly similar as far as they can be compared. The customer satisfaction of both stores are also similar, but the customers of James Allen were more satisfied with the product they received. Combined with the availability of high definition diamond photography that allows a savvy customer to cherry-pick the best diamond, the conclusion is simple: James Allen is clearly the better store if you are looking for an engagement ring. Gold and platinum are the most common metals used for engagement rings. We have listed the pros and cons of each metal below. Yellow gold is made from pure gold and mixed with zinc or copper to create more durable (and cheaper) jewelry. 18 karat gold engagement rings are the most popular choice due to its mix of beauty and durability. 14k is an excellent choice for people with an active lifestyle and is more affordable. Historic significance. Yellow gold has been used for thousands of years. The most hypoallergenic gold color. Lower color diamonds can be used. Has to be polished regularly. White gold is made from pure gold and mixed with silver, nickel or palladium. Often it is rhodium-plated. It is currently the most popular gold color. It is more durable than yellow gold. Most people find white gold a better complement to white diamonds. The rhodium plating has to be repaired every few years. This is quite cheap. Some people are allergic to nickel. Though it is possible to buy white gold without nickel. 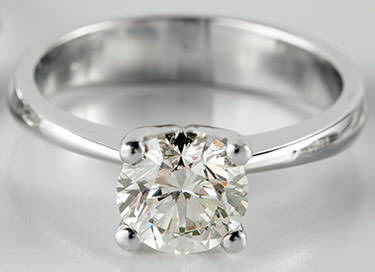 White gold is still by far the most popular choice for engagement rings. Rose gold is made from pure gold mixed with copper. Usually the cheapest gold variant because copper is quite cheap. It is the strongest type of gold. Copper, though rare, can cause an allergic reaction. Rose gold is not as widely available as the other gold colors. Rose gold is becoming quite popular and is the strongest gold color. Platinum is a naturally silver-white metal and is usually sold (almost) 100% pure. More durable than any gold variety. Seen by many as more prestigious than gold. Requires more upkeep than gold. Ring settings are a very personal choice and depend on your own taste. However, it is still important to know what the different terms like ‘prong setting’, ‘cathedrals’ or ‘cluster’ actually mean. Even more important is to know their strengths and weaknesses so you can make an educated purchase. 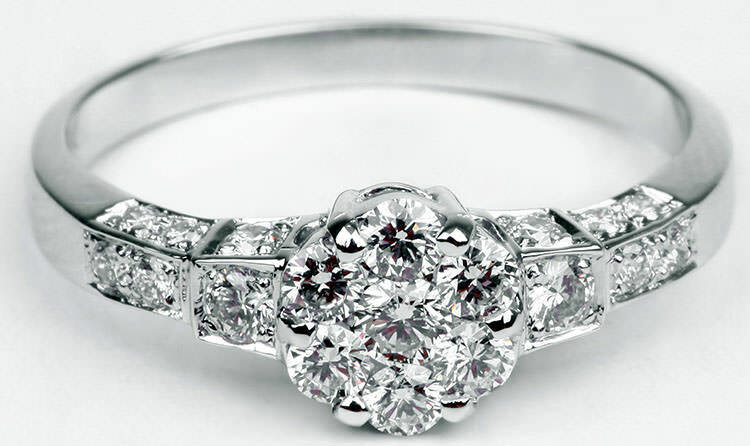 Most of the popular engagement ring settings use prongs to keep the center diamond in place. Prongs are little metal claws and most settings use four or sometimes six of these prongs. The reason four prongs are used is that this leaves more of the diamond visible, but the diamond is less secure than if six prongs were used. An advantage of a prong setting is that you can use the prongs to cover an inclusion that is close to the side. This of course also means that a jeweler can use that to his advantage and sell you a diamond ring with a lower clarity grade. The only way to truly determine the quality of a diamond is when it is not yet set in jewelry. A major drawback of prongs is that they can get snagged. This is especially true for settings where the diamond is placed high on the ring like a cathedral setting for example. If you are the outdoorsy type you should take this into account when choosing a setting. Regardless of how active you are, you should regularly check your ring (and sometimes let a jeweler inspect it) to see if everything is still tightly held in place. The solitaire diamond engagement ring is the most popular setting – all the attention is focused on the center diamond. The solitaire setting has been and still is the most popular engagement ring style. It features a single diamond (or other gemstone) set in a relatively clean and simple band. This draws all the attention to the diamond. Solitaire settings are created to maximize the brilliance of a diamond. A cathedral setting is essentially a variation of the solitaire setting. The difference is that the diamond is ‘pushed up’ from the ring by metal arches, similar to the stone arches seen in cathedrals. The advantages of this setting are that it focuses the attention on the diamond, making it appear bigger. It also is an elegant and timeless setting that will not go out of style anytime soon. The drawback is that the diamond is high above your finger, this increases the chances of hitting something with it or getting it snagged. This is not a suitable setting if you have an active lifestyle because sooner or later you will damage the ring. A marquise cut diamond in a stunning double halo setting – click to enlarge. A halo setting features a ring of smaller diamonds around the center diamond. 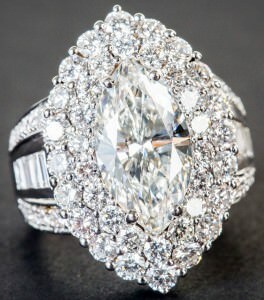 This makes the center stone look bigger and all the small diamonds will dazzle onlookers. Halo settings have quickly gained popularity because they offer a way to save money by buying a lower carat diamond, but still leave a big impression. Some halo designer rings offered by jewelry stores feature colored gemstone to emphasize the diamond through the contrasting colors. A three stone setting as the name implies features three stones. 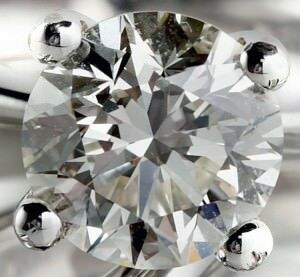 Usually the center stone is the largest or has the highest quality, but sometimes they are the same size. Most of the time these rings feature three diamonds, but you can easily personalize them by using other gemstones that hold personal meaning. A three stone engagement ring featuring three heart cut diamonds and a diamond halo. Pavé setting rings are rings that are quite literally paved with diamonds (pavé is the French word for ‘to pave’). Small diamonds are placed closely to each other and held in place by tiny prongs to create a lane of sparkle that stretches around part of, or even the entire, ring. This type of setting is often combined with a halo setting to turn up the sparkle another notch. A word of warning though: this type of setting requires regular maintenance and losing a small diamond is not uncommon. Fortunately they are cheap (or free) to replace, but you will have to send in your ring for repairs. Another drawback is that because (a large part of) the ring is covered with diamonds it makes resizing very difficult. 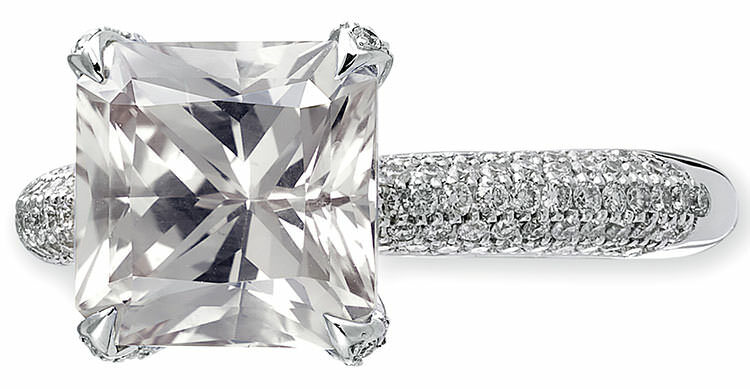 A princess cut diamond in a white gold pavé setting. A bezel setting uses a metal rim that circles the entire stone and keeps it in place. This type of setting is very suitable for those with an active lifestyle as it offers more protection than settings that use prongs. The drawback is that because more of the diamond is ‘encased’ in metal it lowers the sparkle of the diamond. A solution to this problem is the ‘partial bezel’ that leaves the sides open. This allows more light to enter the stone and increases its brilliance. However, a setting that uses prongs is still a better choice for those that are looking to maximize the sparkle of their ring. Many bezel settings feature diamond shapes other than the round brilliant. Princess cuts and emerald cuts are particularly popular. A tension setting, unlike most other settings, does not use prongs to keep the diamond in place. As the name implies it uses tension instead. The diamond is placed between (usually) two metal bands that push towards each other, keeping the diamond firmly locked in place. These types of rings are very elegant as the diamond looks almost as if it is suspended in air. One drawback of this setting is that they are relatively expensive due to the difficulty of creating them. It is an option to buy a tension-style setting that features a bezel that keeps the diamond even more secure, but many people feel that they take away the elegance of a tension setting. Asscher cut diamond in a channel setting – the channel focuses the attention on the main stone. In a channel setting a number of diamonds are set in a row inside the band of the ring itself. This is a particularly popular style for wedding rings and stackable rings that are in style lately. The diamonds set in the channel are very secure, because they are protected by the metal of the ring. This is an excellent choice if you want to wear your ring in all situations. Many channel-set rings, including the one seen to the right, also feature a center stone. These rings are not as secure as a ‘true’ channel set ring. A cluster (sometimes referred to as a clustaire) setting is a variation on the halo setting. In a halo setting the smaller diamonds not only make the center diamond look bigger, they also accentuate it. For a cluster setting the sole purpose is to make the center diamond look (much) bigger than it is. Some cluster rings do not even feature a center stone, but have multiple stones in the center (often these are princess or emerald cut diamonds). The main drawback of this type of setting is that these are often pre-set engagement rings. This limits your ring choice and you are unable to choose your own perfect diamond. A cluster setting featuring seven similar sized diamonds instead of a center stone – in effect looking like a diamond of far greater size. Don’t assume that your regular insurance will cover your engagement ring, double-check it! The last thing people think about when they are about to propose is insurance. Despite being overlooked by most, it is an important aspect of buying an engagement ring. Just imagine, you finally bought the perfect diamond ring and are just waiting for the perfect time to propose. Unfortunately disaster strikes and your diamond is stolen/was dropped down the drain/goes up in flames. (As an aside, yes a diamond can burn in a house fire and will need to be re-cut afterwards losing a lot of its value). In some cases it will be covered by your homeowner’s or renter’s insurance, but these types of insurance often have a limit or exclude jewelry. Be sure to check before you get the diamond shipped to your house! For more information on the subject take a look at our article on jewelry insurance. A mild detergent, a simple soap is perfect. Do not use strong household cleaners like chlorine, bleach or acetone. Do not use abrasive cleaners like baking soda or toothpaste. This will not effect your diamond, but it certainly can damage the metal of your ring. Ultrasonic and to a lesser extent steam cleaners are a fast but not necessarily safe cleaning solution. Especially the ultrasonic jewelry cleaner can shake loose diamonds when they are in a prong setting. Please consult your jeweler before using either of these machines. You can find our full guide on cleaning diamonds at home here: How to clean diamonds at home. For advice on professional cleaning: When to hire a professional jewelry cleaner. Our recommendation: If you only care about the looks, a clarity enhanced diamond is an excellent way to save a lot of money. If you or your significant other only wants a natural product you should steer clear of them. As we mentioned before, diamond clarity has a (too) large effect on the price of a diamond. As diamond clarity essentially is just a measure of the amount, the size and the placement of inclusions it begs the question: what if you could remove those inclusions? In clarity enhanced diamonds that is exactly what has been done; inclusions have been removed, filled or bleached to improve the clarity, and sometimes even color, of the diamond. There are several methods that make this possible. The first and most common method is ‘deep boiling’. All diamonds are boiled with acid to remove any external dirt that has stuck to the diamond. Deep boiling goes a step further than that. By increasing the boiling time it is possible to reach some internal dirt. A virtually invisible crack in the diamond can lead to a so-called ‘open inclusion’. The acid can reach the open inclusion and remove the dirt inside. The acid has no effect on the diamond so this is a completely safe process. The deep boiling process is so cheap that virtually all high quality diamonds on the market are treated in this way (even though many do not need it). This practice is condoned by the GIA and has no influence on the price of a diamond. The next two methods have a significant effect on the price of a diamond. A clarity enhanced diamond is an excellent way to save money without compromising on beauty, Keep in mind that they are not natural however. There are two methods of laser drilling. The first is ‘regular’ laser drilling. Here a laser is used to drill a hole to an inclusion after which the diamond gets deep boiled to remove the (usually) black inclusion. This method is quite easily detectable under magnification because it leaves a tunnel. To the naked eye however it is not visible. The second method is ‘special laser drilling’. Instead of simply drilling to the inclusion a ‘plane’ is burned into the diamond until the inclusion is reached after which the diamond is deep boiled again. This method looks more natural and is therefore harder to detect. This of course opens up the possibility that a dealer will sell it to you as if it is a natural diamond, with the according price tag. The final piece of the appeal of clarity enhanced diamonds is fracture filling. Here all fractures that can be reached from the surface are filled with a special compound that resembles a diamond. Usually a diamond that has been laser-drilled will be treated this way. The total effect of laser drilling and fracture filling is quite dramatic. A diamond with clearly visible inclusions treated in this way can often be made ‘eye clean’. Both laser drilling and fracture filling should be disclosed by a dealer. Unfortunately there are a lot of dealers out there that do not disclose these treatments. You will think you got a great deal on a beautiful diamond, but in reality you just got scammed. Prices of clarity enhanced diamonds are easily 50% lower than natural diamonds. Note that GIA does not grade fracture filled diamonds. This will make it harder to judge the quality of these diamonds, especially because many are graded by (very) loose grading labs. Still if you do not view diamonds as an investment (they really are not) a clarity enhanced diamond is excellent value for money. While diamonds are still by far the most popular gemstone used in engagement rings other precious gemstones are enjoying an increase in popularity. For example: after Prince William proposed to Kate Middleton with an 18 carat blue sapphire engagement ring an immediate increase in blue sapphire sales was seen. 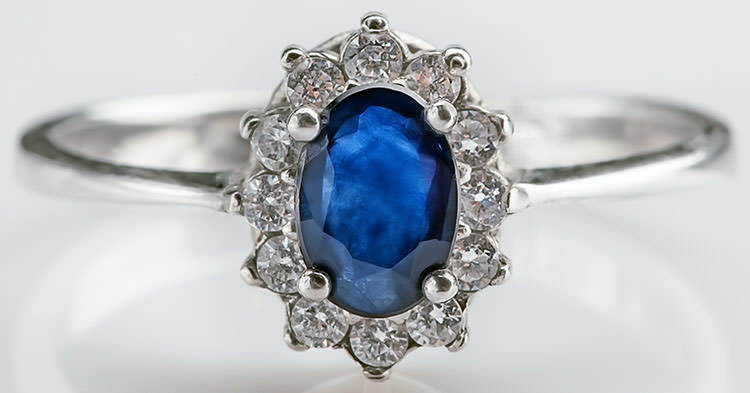 A blue sapphire engagement ring with a diamond halo in white gold. The traditional and most popular gemstones are rubies, emeralds and blue sapphires. These three gemstones are sold by most jewelers with a large inventory. James Allen for example now also offers these gemstones, as well as pink and yellow sapphires. Just like with diamonds you can view every loose stone through high definition photographs to make picking the best stone possible. As far as we know this is the only jewelry store that offers this option. Their collection ranges from 1 carat yellow sapphires that sell for around $500 all the way to a stunning 5 carat emerald priced at $50,000! You can find pretty much any gemstone in an engagement ring these days though. If you want to save money you can by looking for affordable gemstones like aquamarine, blue topaz or garnets. On the other hand if you are looking to buy something far more exclusive (and more expensive) than a white diamond you should take a look at alexandrite or paraiba tourmaline. These stunning gemstones can easily sell for over $10,000 per carat. One thing is very important to keep in mind though when you are looking at colored stones. Many of these gemstones are not (nearly) as durable as a diamond. As an engagement ring is something you will treasure for a very long time this is a big drawback. A parting thought: make sure that your recipient actually wants a colored gemstone engagement ring. Many brides-to-be are only interested in the traditional white diamond. No matter how expensive, exclusive or beautiful the colored gemstone you picked is, they are the ones that will wear it, so cater to their wishes. If you are not sure ask their girlfriends, sister(s) or mother (make sure they can keep a secret though! ).